Travel to the northwest coast of Australia where a remote tropical oasis awaits. 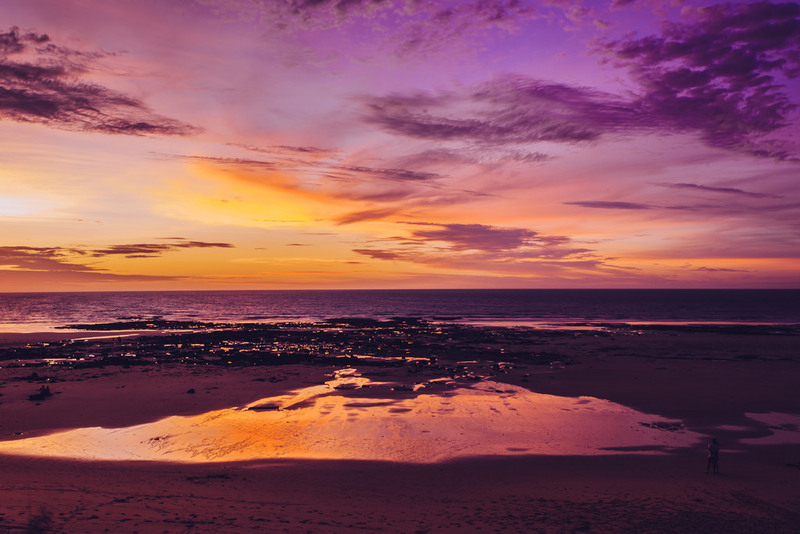 Perched in between WA’s Eighty Mile Beach and the foot of the Dampier Peninsula, Broome is where the desert meets the sweeping tides of the Indian Ocean. See the must-dos, food, drink and excursions to embark upon outside of this West Australian town. Head to the iconic Cable Beach to admire the white sands, red cliffs and crystal-clear water that stretches for 22km. Ride a camel on the beach at sunset for an unforgettable experience. Check out the historical museum and the world’s largest pearling centre. Also, be sure to explore the pearl farms nearby for boutique pearl and jewellery shopping. Take in the contrast of colours on Roebuck Bay. Known for its stunning scenery, you can also spot dugongs, dolphins and turtles off the shoreline. Take a dip in the high tides of Town Beach (the closest beach to town) but make sure it’s not stingray season! Staircase to the moon: From April to October a natural phenomenon occurs over Roebuck Bay. The stunning optical illusion is of a stairway that reaches all the way to the moon. The phenomenon is caused by the full moon rising and reflecting off of the exposed mudflats when the tide is extremely low. If you’re looking to escape the crowds, this beach is a favourite with the locals. Soak up some sun, play sport on the beach, have a picnic, swim in the calm, turquoise waves and admire the eclectic rock formations. A 2-minute drive from Reddell beach perches Gantheaume Point. If you’re into history, this location features the ultimate discovery. Nine species of dinosaur footprints have been identified in this area (about 130 million years old). It might not be Jurassic Park, but you’ll certainly take a step back in time. Beginning as a cable station for international telephone communication, Broome’s night markets are a must-visit. The markets are populated with pearl boutiques, bespoke cafes, art galleries, pubs and more. Learn about the local Aboriginal culture of the Yawuru people. At Minyirr Park, three walking trails are open for exploration. Nagula trail is about a 30-minute hike to the ocean. Lurujarri is through the dunes and a 3-hour hike from Cable Beach to Gantheaume Point. Minyirr is about four hours return (or two hours one way) through the bush. A taste of Egypt in Broome! Known for its Middle Eastern cuisine such as kebabs, falafel, scrumptious dips and roasted meats, this venue is perfect for vegetarians and meat eaters alike. A great feed for brekkie while overlooking the stunning views of Roebuck Bay. Have your meal alfresco and sip your coffee while taking in some fresh morning air and Vitamin D.
What started as a pop-up café transformed into a full-time eatery. With top notch coffee brewing skills, healthy juices and Mexican-style breakfasts, this is a café you won’t want to miss. In Japanese, Zensai means “small pretty things”, and this restaurant certainly lives up to its name. Create your own dining experience by choosing what you like, or leave it to the head chefs to decide (it will all be delicious either way!) Make sure you book ahead of time to avoid disappointment. For Modern Australian cuisine and Asian-inspired share plates, head to Aarli Bar for a long lunch or grab a table for evening time cocktails (including a killer wine list). Sitting just on the foreshores of Cable Beach, relax with a cocktail and a casual dinner menu while drinking in the sunset. Location, location, location. Open until the early hours of the morning, this venue is a place for the party-goers. Think international DJs and frequent special events. Broome’s famous brewery, enjoy views across the turquoise waters and brews that reflect the region’s surroundings. Quench your thirst a stone’s throw away from the beach. Bliss. At the very end of the Dampier Peninsula and about a 7-hour drive from Broome is Cape Leveque. Secluded beaches, the Mother of Pearl Shell alter at Beagle Bay, picturesque bushwalking trails and striking landscapes. Only the first 100km of the Broome – Cape Leveque Road is unsealed, so be sure to hire a 4WD to explore the wonders the Cape holds. At Cape Leveque, learn about the indigenous culture with a remote wilderness camp, run by the indigenous Bardi Jawi communities. No cell reception proves for a unique, off-the-grid experience. Just 50km north of Broome, James Price Point is the perfect place for a short camping trip or a quick day trip to a secluded destination where the red cliffs meet unspoiled white sands. Don’t forget to bring your own drinking water! This road is said to be the path that follows the sea serpent of the Dreamtime legends. The story describes how the snake wound its way across the coast of WA and created a pathway 2,400km long. Driving along the trail, travellers will stumble upon turquoise reefs, proper Aussie outback, and Eighty Mile Beach – be sure to have a swim. A 9-hour drive south of Broome is a national park known for the largest concentration of rock art in the world. 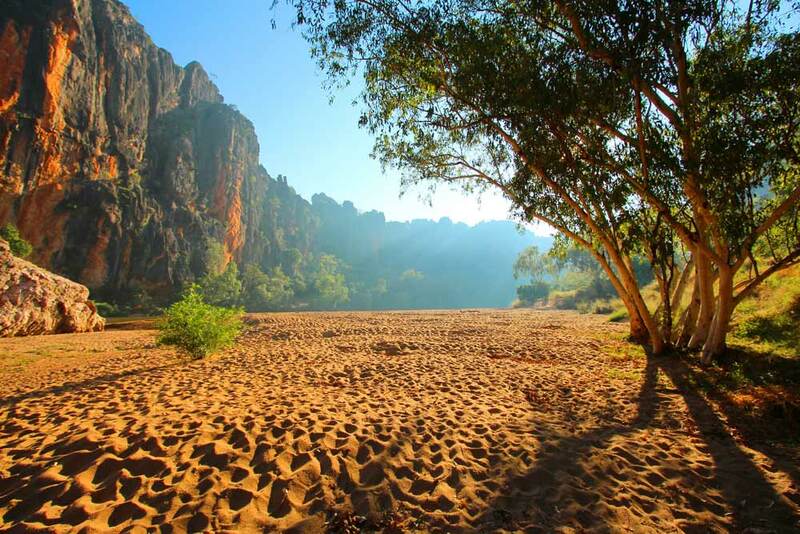 It’s home to three Aboriginal tribes. History is painted on the walls and cliffs of the rocks, telling stories of life well before our own. There are also spiritual ceremonial sites to explore. The power of The Kimberley’s ocean tides is just a ride away. Experience the natural wonder of the horizontal waterfalls, located deep within the Kimberley near Talbot Bay and Buccaneer Archipelago. Full day, half day, or overnight tours are available.